A new set of machine learning algorithms developed by U of T researchers that can generate 3D structures of tiny protein molecules may revolutionize the development of drug therapies for a range of diseases from Alzheimer’s to cancer. At the same time, researcher Jana Broecker and colleagues in the Ernst lab in U of T’s department of biochemistry have discovered a new way to obtain membrane-protein structures. Their research, to be published tomorrow on the cover of the journal Structure, should drastically speed up the discovery of new protein structures – thus also contributing to the development of new and better drugs. 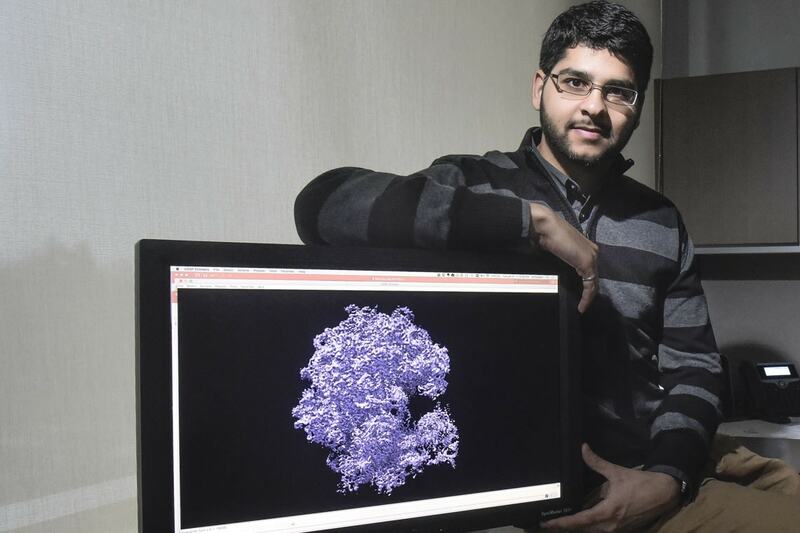 In Punjani's research, the new set of algorithms reconstructs 3D structures of protein molecules using microscopic images. Since proteins are tiny – even smaller than a wavelength of light – they can’t be seen directly without using sophisticated techniques like electron cryomicroscopy (cryo-EM). This new method is revolutionizing the way scientists can discover 3D protein structures, allowing the study of many proteins that simply could not be studied in the past. The algorithms, which were co-developed by Fleet’s former post-doctoral researcher Marcus Brubaker, now an assistant professor at York University, could significantly aid in the development of new drugs because they provide a faster, more efficient means at arriving at the correct protein structure. Punjani adds that existing techniques often generate incorrect structures unless the user provides an accurate guess of the molecule being studied. What’s novel about this approach is that it eliminates the need for prior knowledge about the protein molecule being studied. Meanwhile, the team’s startup, Structura Biotechnology Inc., has developed the algorithms into a new cryo-EM platform called cryoSPARC that is already being used in labs across North America. The startup has received funding and support from U of T’s Innovations and Partnership’s Office (IPO) through the Connaught Innovation Award, U of T’s Early Stage Technologies (UTEST) program, the Ontario Centres of Excellence (OCE) and FedDev Ontario’s Investing in Commercialization Partnerships program with York University.